If you are looking for Christmas cheer, you will be disappointed, tonight. I’m rather more Grinch-like than Cindy Lou-like tonight, but with good reason. In less than two months I’ve had bronchitis – twice – and my son’s sick with his own eye and ear infections. I’m nearly at the end of my rope but the show, as they say, must go on. No rest for the weary. Bah humbug. Bah. So – why am I blogging? That’s the very same question my parents asked me, repeatedly, when I first informed them I would be launching a food blog. Back then, perhaps it was a bit of a vanity project. Now, it is my retreat. When I can control so little of my world, this is one small corner of the cyber-sphere that is mine. When I talk, it doesn’t really matter if no one’s listening. I bake because I want to. I write because I want to. And it must be said that baking, for me at least, is more than just a stir-and-pour endeavour. For me it is a sentimental act, for me it is an act of love, it is an ode to a memory. And in the case of these Chocolate Gingerbread House Petits Fours, it was a combination of all three of the above. At a time in my life when I am restricted from travelling like I used to, this village of bite-sized houses reminds me of the snow-capped towns of narrow, long-ago built European homes as seen from the window of a train. Normally I hate the window seat more than anything. Unless it’s on a train in Europe. And then, I can gaze outside and imagine what life would have been like if my great-great-grandparents had taken the boat to France rather than Bulgaria after the Armenian Genocide. I still do wonder, I do, but these days it’s from my domino-shaped kitchen with the soundtrack of a toddler discovering his tongue, than from the comfort of a first-class seat as I wait for the dulcet tones of the multilingual attendant announcing the next stop. And that’s why I bake, and that’s why I blog. To remember, and to dream. But enough sentimental nonsense for one night. I found this recipe in the latest issue of Martha Stewart Living (but you can also find it here) and thought it would be a charming, if somewhat kitschy and easy treat to take to work during the holiday season. I also figured it would be tiny enough to eat while continuing to type with the other hand (as I tend to do). Cute yes, easy no. It’s a finicky thing to make and the assembly took rather more time than I liked. I accidentally tossed in 1.5 cups of brown sugar rather than 1 cup. Oops. To make up for my mistake, I cut down the molasses content by about 2/3 of a cup. This could account for the dried-out cake, but then again, so could the fact that it was sitting out for hours. If you’d like to make this in steps, it froze extremely well. No. To be honest, the cake was not chocolaty enough, nor spicy enough, nor moist enough to merit any sort of accolades. If it weren’t for the presentation, this wouldn’t have much going for it. And really, you can make this with a red velvet cake or another chocolate cake recipe. The instructions are simple enough, yes, but they don’t look quite right unless you take a bit of time to cut the cake into cubes properly. And please, use a serrated knife or you will be complicating things. Three stars out of five, and I’m being generous. Mary, Happy New Year!!! Sorry these petits fours weren’t what you were hoping, but they look really nice, lol! 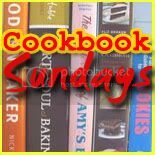 Thank you for sharing with Cookbook Sundays and all the best to you and your family in 2011! Thanks very much! Happy new year to both of you as well! These really look cute, even if you were disappointed with them. 🙂 I hope both you and your son are feeling better, and that this new year will be a happy and healthy one!